Charities have accused the government's costing watchdog of stalling over whether to quash dementia drug restriction proposals. The National Institute for Clinical Excellence (NICE) proposed in March to restrict four Alzheimer's drugs because they are not good value for money. A final decision on rivastigmine, memantine, donepezil and galantamine use was to be made this month. NICE says it needs more time to check how much the drugs benefit patients. Alzheimer's effects everybody differently, but it can gradually rob people of their ability to enjoy even the simple things in life. Diana Barnes was a great letter writer before she was diagnosed three years ago. Now she can barely write at all: "I try to write but as I go to put the word down it seems like there is something stopping me, or a different character appears from the one I wanted." It has asked drug companies for more data. If it decides to go ahead with the withdrawal across England and Wales, thousands of patients will be denied the only drug treatment available to them, argue dementia charities and carers. However, patients already taking the drugs would not have them withdrawn, NICE said. The guidance does not mean the drugs do not work or are harmful - just that the cost to the NHS does not warrant the benefits gained from patients taking them. The drugs, which campaigners estimate cost £2.50 per day per patient, improve memory and can make daily living tasks easier. Campaigners and medical experts condemned the move, which reverses previous NICE guidance in 2001 that said the drugs should be used as standard. A new alliance - Action on Alzheimer's Drugs - has now been formed. Clive Ballard of the Alzheimer's Society and member of the alliance said: "It's a complete delaying tactic. "The requirement for more evidence is ridiculous. "More than 32 placebo controlled clinical trials demonstrate they improve memory and every day activity." He said it was "absolutely outrageous" to withhold a clinically effective treatment based on a "modest cost" of £2.50 per patient per day. Professor Susan Benbow, Chair of the Faculty of Old Age Psychiatry at the Royal College of Psychiatrists, accused NICE of being ageist - a concern echoed by the Liberal Democrat spokesperson for Older People, Sandra Gidley MP. Sandra Gidley said: "NICE need to demonstrate that the way they calculate cost-effectiveness is not ageist and does not unfairly discriminate against older people." Pauline Ford from the Royal College of Nursing said if the prescribing ban went ahead it would put doctors and nurses in a difficult position - they would have to explain that an effective treatment was not available for financial reasons. Eisai Limited, the manufacturer of donepezil, and Pfizer, their co-marketing partner, said Nice's evaluation did not address the carer burden or potential gain to carers when Alzheimer's patients receive treatment. 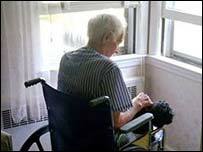 Nor does it account for the potential cost savings made in delaying the need for nursing home placement or additional nursing care when patients are taking these medicines, said spokesman Professor Nick Bosanquet, professor of healthcare policy at Imperial College, London. "This unfairly tips the balance against these treatments and incorrectly leads to calculations that they are not cost effective," he said. Andrew Dillon, chief executive of NICE and executive lead for this appraisal said: "We are acutely aware of our responsibility to people with Alzheimer's disease, their families and carers, to ensure that every effort is made to obtain all the available evidence on these drugs. "We need to make the right decision, based on all the relevant evidence. "We think there is more data which could affect our decision and we are asking the drug companies for access to it." He said the responses would be considered in October. A decision will be reached after that. Conservative Shadow Health Secretary Andrew Lansley said: "Nice are right to identify the need for more data on clinical effectiveness for sub-groups of patients. "However, the central issue is not resolved, which is that the benefits of prescribing shouldn't be limited to the NHS, but should also include the impact on carers and family." Dr Richard Barker, director general of the ABPI, said: "The door remains open for further discussion and it is vital that it is not slammed in the faces of people with Alzheimer's and those working with them to alleviate this distressing condition." What would I do without these drugs?